This week Kenny and his team have created a refreshing Interior Design Layout Pack with eight different pages that provide everything your average interior design company will need to get up and running in just a few clicks. You can use all of the included images without any restrictions, for all kinds of purposes–including commercial ones. This interior design layout pack represents the core values of each interior design company out there; style and expertise. 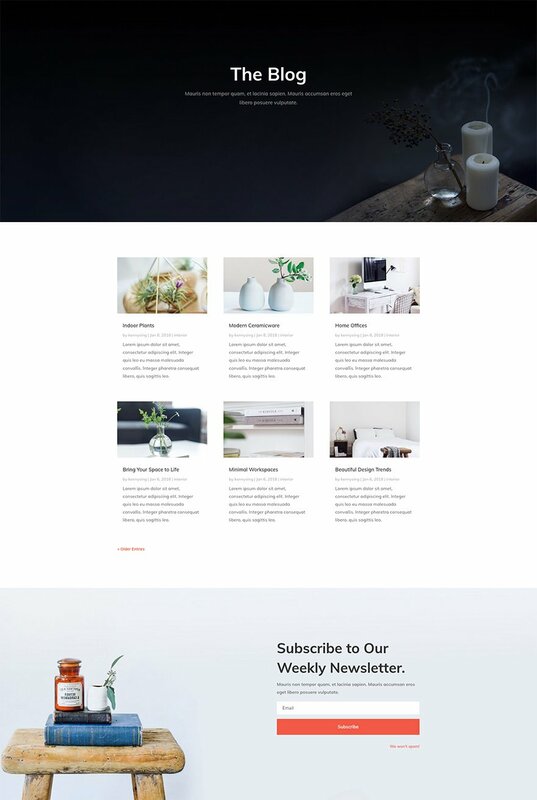 With eight elaborated layouts that contain stunning and unique images, this layout pack is ready to bring your interior design website to the next level. Each one of the layouts is a combination of some of Divi’s most desirable built-in options and look great on desktop, as well as on tablet and mobile. 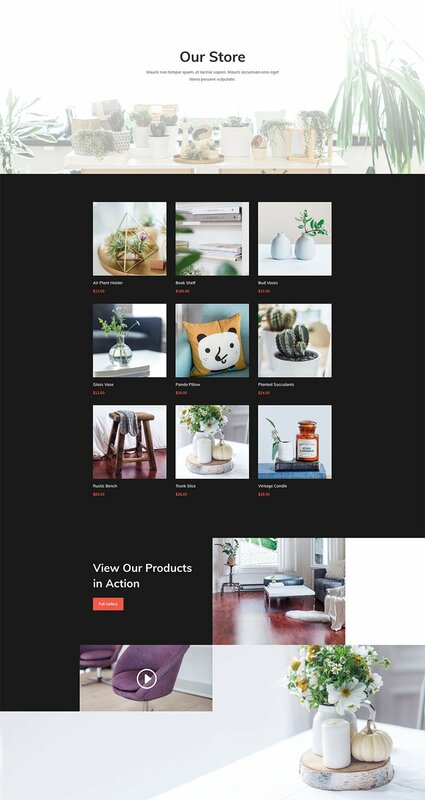 To use the Interior Design Layout Pack on your own Divi website, you will first need to download it using the button below. To gain access to the download you will need to subscribe to our Divi Daily email list by using the form below. As a new subscriber you will receive even more Divi goodness and a free Divi Layout pack every Monday! If you’re already on the list, simply enter your email address below and click download. You will not be “resubscribed” or receive extra emails. Once you have downloaded the layout pack, locate the divi-interior-design-layout-pack.zip file in your downloads folder on your computer. Double click the folder to unzip it and then navigate inside the divi-interior-design-layout-pack folder. Inside this folder you will find 8 files, each of which is a unique layout that you can import into your Divi Library. To do so, navigate in your WordPress Admin to Divi > Divi Library > Import & Export. You can select the individual layout you desire or choose the All Layouts file to important everything at once. We hope you enjoy this interior design layout pack. And to help ensure that you do, we’ll be doing a live stream on our Facebook page this Tuesday at 3pm EST to walk through what it might be like to actually use this layout for your own website instead of simply importing it and loading it up. We’ll talk header and footer design, customizer settings, converting certain sections to global, and more. What can I say – another absolute stunner. Amazing layout as always. Thanks ! Did you thing about providing file with customizer options for fonts so that fonts in module itself could be saved as default font? Right now unfortunately we can’t change fonts globally in these layouts and we have to go one module by one :/. You can modify default color (the one baked into the site) by changing the siteʻs CSS (Good tutorial here: http://www.eleganttweaks.com/foxy/change-orange-color-scheme/) Hope this helps. WOW! Nice and clean layout. Thanks DIVI team. WOW, one of your best! Looks amazing. Thanks again for showing what is possible with Divi. Will You plan to add those free layouts to member area? It would be UX friendly 😉 to group all of those in one download page, without searching through blog posts. I think their goal soon is to add a “theme store” to Divi directly – so within the page builder you’ll see the theme store. They’ve already teased it’s coming… just waiting now. A DIVI update is going to do this through the backend of the DIVI theme. Best one lately! Nice work Elegant Themes. Great layout Donjete. You rock! Divi rocks! Nice and clean. Love it, very useful as a startingpoint for a new project. Thanks for this very nice work, only thing is that on mobile the text needs resizing and padding in parts as it gets squished. How about trying something really different. Brutalist design based site layout. I love all the design layouts so far but this has got to be one of the best. Great work ET Design Team! Hi, is there an issue with the file size? I can’t get any of the json files that are bigger than 1mb to import. Is there something I should change to increase? I checked on three other sites and the 3 files below 1mb in size work fine. The other bigger files just hang for 5 or 10 mins on 1%. I had thought I could import into another site and export the pages as xml but couldn’t get to load in the two other sites I tried either. Beautiful design pack, i will buy Divi soon for my other website. Love it! Again a great layout with inspirational design! I am new to Divi so if I am missing something and one can view them somewhere/somehow easily when wanted, please let me know. Hi Nikki! I usually just drag the images from this page and save them in a folder along with the download of the layout. If you scroll up to the image that starts directly below the big blue box, it’s one nice image that includes each of the layouts in the pack. You can also save each .jpg of each layout individually as you scroll farther down the page. A third option is to install the Chrome extension called Nimbus (and there are others too) which will allow you to take a screenshot of an entire page without scrolling — it does it automatically. I hope that helps! Great design.. just having problems importing!! The import gets to 1% and then i get this message “This file should not be imported in this context.” Ive googled tried suggestions of uploading direct to page etc.. still not working. Can anyone help pls? Donjete, this is one of the best layouts so far available here! Thanks a lot! How can I delete the header? When I import your layout and use it, on my side the header and the logo are displayed. On your template, not. which is the best and fast loading wordpress theme for my site all themes are awesome in this site i want to buy a theme for my blog ? thanks, beautiful design … however I can not import to my divi. I am using Extra, and when I import to my library, it says :This file cannot be imported. It may be caused by file_uploads being disabled in your php.ini. It may also be caused by post_max_size or/and upload_max_filesize being smaller than file selected. Please increase it or transfer more substantial data at the time. i love this divi verymuch, makes my website more profesional. I have some troubles with this layout pack. 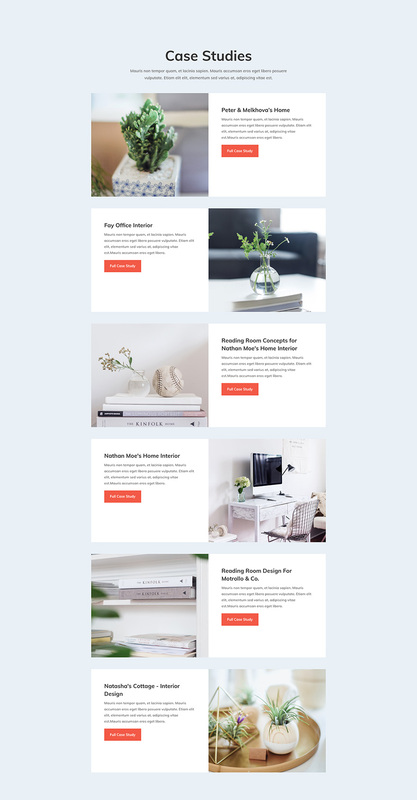 When I made an upgrade of Divi version, the layout was displayed only the first time, then mu website lost the design. I should to apply a Old Divi version 3.0.9 to make it work. 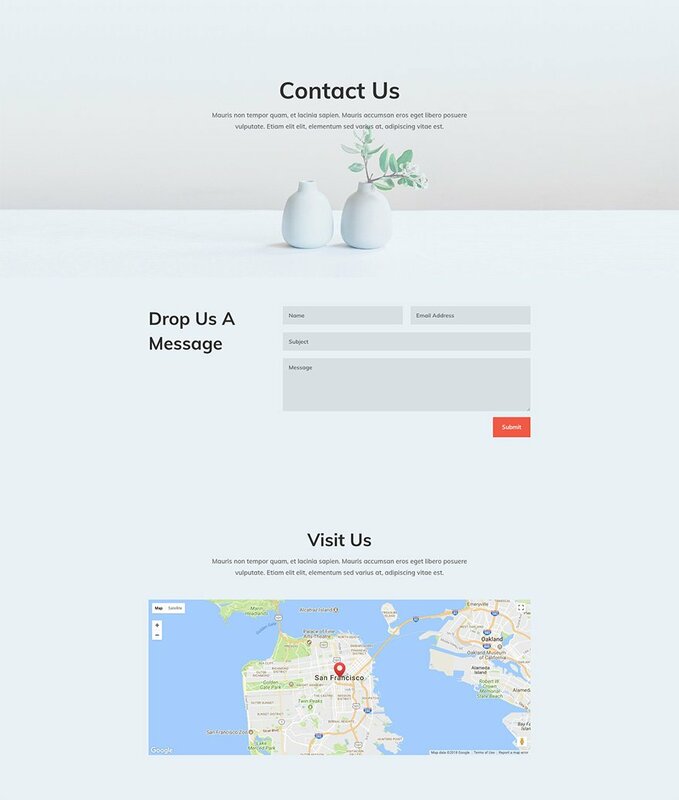 Do you have any solution to use the last update of divi with this layout? a nice an concise design. I’d say that the Portfolio page is still having some hiccups, it would be nice if you could fix the layout for tablets so that image-text-columns would keep equal heights. Very Nice Article.. Keep Posting these type of articles. Love this layout pack and have been working with it, to customise it, since I won’t use it as is (of course). Now, when trying to replace this image (http://backtobhakti.com/2018/wp-content/uploads/2018/02/header-bg.jpg) I am getting a wp image upload ‘http error’ because the file size (dimensions, not the weight) are too large. Any ideas how to resolve this?